Turkey’s Fears: What Threats Could Syrian Crisis Unleash? ANKARA, Mar 24 2012 (IPS) - Enough calls to reason. It is time for collective action. That was the message Turkish Foreign Minister Ahmet Davutoglu sent Thursday to his European Union (EU) colleagues, whom he will be meeting later this week in Brussels. This warning is the latest in a series of tough communications Ankara has issued over the past four months to Syrian president Bashar al-Assad. Davutoglu’s call for force rather than dialogue came a day after the 15-member United Nations Security Council (UNSC) unanimously demanded that Damascus immediately implement a peace plan formulated by UN and Arab League special envoy Kofi Annan and discussed with Assad earlier this month. Since hostilities between Damascus and anti-regime demonstrators in Homs and other provincial cities began a year ago, at least 8,000 have died, according to U.N. estimates, as protests have escalated to armed clashes. Until October 2011, Turkish leaders attempted to convince Assad to use moderation. But those efforts led nowhere. Turkish position up to that point was consistent with a decade-long rapprochement between Ankara and Damascus, which followed 65 years of relations strained by a territorial dispute over Hatay, formerly an independent French protectorate and now part of Turkey. Has the U.N. Reached a Dead End in Syrian Crisis? In 2003, relations improved after the Turkish Parliament voted against American troops crossing the country to enter Iraq from the north. At that time, Turkish Prime Minister Recep Tayyip Erdogan’s Justice and Development (AK) Party held the majority position in parliament. By 2009, a series of diplomatic exchanges and summits, culminating with reciprocal visits by Turkish President Abdullah Gul to Damascus in May of that year and Assad to Istanbul two months later, sealed what appeared to be close ties. In addition to a score of commercial treaties, a military agreement was also signed and a joint strategic committee established. Visas were abolished; a telecommunications network linking the Black Sea with the Persian Gulf through Syria was agreed; and Turkish private investment flowed into southwards. As a result, the Ankara’s about-face towards the Assad dynasty has surprised both business and political observers. But a closer look reveals that several reasonable motives for Turkey’s shift. One explanation is that Erdogan, a household name in the Arab world since he harshly criticised President Shimon Peres in 2009 for Israel’s Cast Lead Operation against Gaza and downgraded relations with Israel after the Mavi Marmara incident in May 2010, could tarnish his image by appearing to condone Assad’s bloody crackdown. Indeed, Syria has become the black sheep of the Arab world, even for those who dispensed kisses on both of Assad’s cheeks five months ago, and Gadhafi’s fall in October also seems to have persuaded the Turkish leadership that Assad’s end is inevitable. Turkey is also trying to position itself as the democratic paradigm for Muslim statehood and society and restore its commercial pre-eminence in North Africa. In Libya alone, regime change has caused Turkish businesses to lose or put on hold contracts totalling 25 billion U.S. dollars. 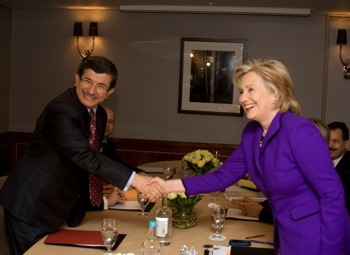 In addition, Erdogan and Davutoglu’s new tone coincides with warming relations with the White House, following Ankara’s decision to be a loyal partner despite its earlier objections to foreign intervention in Libya. Turkey has become an indispensable ally for the United States, in part because of uncertainty over Iraq’s future following the departure of U.S. troops in December. U.S. Secretary of Defense Leon Panetta held talks in Ankara the day after the troops’ withdrawal ceremony. A few weeks earlier, American drones stationed in Iraq had been transferred to the U.S. base at Incirlik, in southern Turkey. “I suppose many more Turkey-based drones will be flying over Iraq in order to continue monitoring things,” says Soli Ozel, a professor at Kadir Has University and expert on the Middle East. In December, Turkish Foreign Ministry spokesman Selcuk Unal said Washington had proposed to Turkey to take over the influential role of training Iraqi military personnel, after the U.S. pullout. “We will be considering it,” confirmed Unal. U.S. Vice President Joe Biden also held meetings with Gul and Erdogan in December, and on March 13, CIA chief David Petraeus a last minute stop here to meet the PM and the director of the Turkish National Security Agency (MIT). Similar activity by American high-ranking defence and intelligence officers had been observed last spring. In addition to providing safe haven for some 17,000 Syrian refugees, the Turks provide advice to the opposition Syrian National Council (SNC) as well as some training and support to the Free Syrian Army (FSA), whose members have taken refuge in Turkey. Some in political and diplomatic circles here speculate that Erdogan’s AKP is keen to see a Sunni-led government in Damascus replace Assad and his regime, whose security forces, in particular, are dominated by fellow Alawis, who belong to a sect that is an offshoot of Shi’a Islam. In the larger regional context, such an outcome would align with the interests of Saudi Arabia and Qatar, both of which have called for greater foreign intervention in Syria, including supplying arms to the opposition. The AKP, which is an Islamist party, may also favour such a result, given that three of every four Turks are Sunni Muslims. Ankara’s concern is not Assad’s fate, but the Pandora’s Box his demise will open. With some 30 million ethnic Kurds in the region, half of whom live in southern and southeastern Turkey and the rest in Iraq, Iran and Syria, the risk of a pan-Kurdish movement is real. Kurds have not revolted against Damascus and are autonomous in northern Iraq, but have been politically and militarily active in Turkey and Iran for decades. Turkey has been at war since 1984 with the Kurdish Workers Party (PKK), a rebel group classified as a terrorist organisation by Turkey, the United States, EU and Syria. The conflict has killed some 35,000 people, most of them in the southeast. Since November 2011, Damascus has occasionally been accused by the Turkish media of assisting the PKK against Turkish security forces operating in the south. However, there is no evidence of such assistance, and Syrian Kurds, most of whom live near the Turko-Syrian border, do not seem disposed to take up arms. “We want an autonomous, secular state where we can exist under democratic rules,” says Ali Shemdin, a senior official of the Kurdistan Democratic Party of Syria (KDPS), in a statement that does not sound especially revolutionary. But in recent weeks, Iraqi Kurds have given signals that they would be prepared to evolve from their autonomous status to an independent state. Dramatic events in Syria and strengthening of Turkish determination to annihilate PKK could ignite cross-border nationalism. This threat may be the best explanation for the gap between Ankara’s anti-Assad punitive rhetoric and its corresponding actions.